With the conclusion of the General Assembly’s special session over Charlotte’s transgender bathroom law, Lt. Gov. Dan Forest will be turning his attention to a Campus Free Expression Act meant to protect free speech on UNC system campuses, strike down restrictive speech codes, and punish those who attempt to stifle public discourse. Forest spokesman Jamey Falkenbury said the bill would be ready to file during the first week of the regular legislative session, which opens April 25. “Because of the bathroom ordinance we really put this on the back burner” while lawmakers were meeting to craft a statewide nondiscrimination policy on public accommodations, Falkenbury said. “We haven’t lined up sponsors yet,” or determined if the legislation would be modeled after laws already passed in New Hampshire, Missouri, or Virginia. “We’re going to do one that’s best reflective of what needs to happen here in North Carolina,” Falkenbury said. “I think that’s fantastic. I think it’s a great way to ignite a fire under the Board of Governors, and it’s a great way for students to really feel protected,” said Anna Beavon Gravely, North Carolina state director for Generation Opportunity, a public policy organization advocating individual liberty and entrepreneurship for people between the ages of 18 and 34. “When you attend a public school you shouldn’t have free speech zones. The whole thing is a free speech zone,” Gravely said. Free speech is vital especially on a college campus because it is “a bastion of ideology, and marketplace of ideas, and that’s something that should be protected,” she said. While her organization has found robust support for free speech on campuses from the Triangle to Charlotte, some administrations “are not friendly to it,” Gravely said. Off-campus activists try to blunt it. “You have professors who are not friendly to it, and you have professors who have been victims” of political correctness for saying something that offended someone. 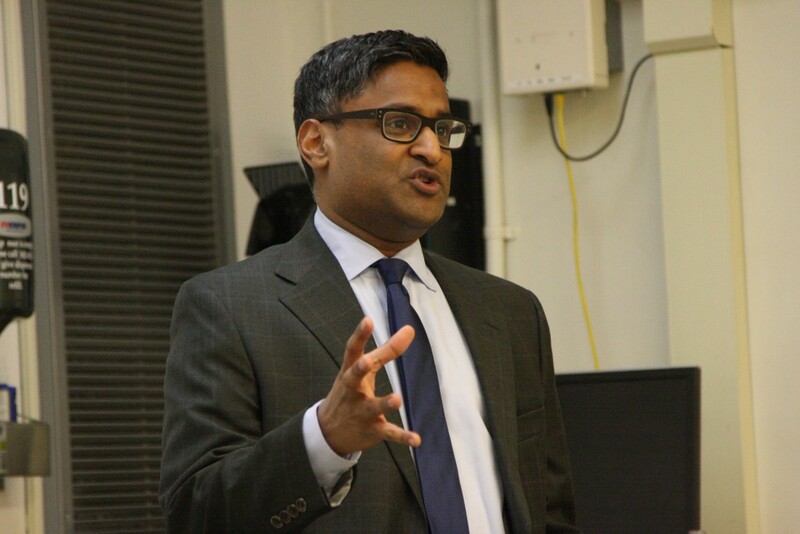 Generation Opportunity was among several organizations that sponsored a speech on Wednesday at Duke University by Ramesh Ponnuru, senior editor of National Review magazine, and visiting fellow at the American Enterprise Institute, whose research areas include constitutionalism. Ponnuru, a self-described classical liberal, gave tempered assent to the concept of the Campus Free Expression Act during an interview with Carolina Journal. “I think at public universities it may make sense to do something like that, but in general I’m more in favor of sound internal governance by these institutions,” Ponnuru said. Conservatives, libertarians, and classical liberals too often don’t speak out for fear of assumptions being made about them through the lens of political correctness, he said. Ponnuru, of Asian Indian descent, believes the First Amendment is at risk, as evidenced by young people believing it should be illegal to say something offensive to minority groups. He said that is “a very dangerous attitude that has to be combated because these are the people who will be voting, and making laws,” and that is why he is making a tour of college campuses at his own expense advocating free speech. During his remarks to students, Ponnuru said free speech must be defended constantly. Maintaining open dialogue is a fragile achievement, and many societies don’t safeguard expression to the degree the United States does. Many university administrators side with student protesters, and believe it would be wrong to resist their demands, so they support suppression of speech, he said. As an example he cited the Charlotte twin brothers David and Jason Benham, former professional baseball players and later successful real estate businessmen who signed a deal for a reality series on HGTV. The cable channel pulled the plug after backlash from homosexual groups over the brothers’ support for North Carolina’s constitutional amendment declaring marriage between a man and woman. “But even if tolerance is not an ironclad and universal notion, it’s a valuable disposition,” Ponnuru said. “It should not need saying, but unfortunately does, that in our society there are good people on both sides of debates” on burning cultural issues.